This recipe is a twist on the traditional cheesecake brownies. The goat cheese adds more of a tang and sophisticated flavor to the brownies. Feel free to use a boxed brownie mix or make your own! We do suggest dark chocolate over milk though. The dark chocolate better compliments the flavors of the goat cheese. Preheat oven to 350 degrees F. Lightly grease an 9×9″ square nonstick baking pan. Make goat cheese mixture by beating together the first five ingredients until smooth and well combined. Set aside. 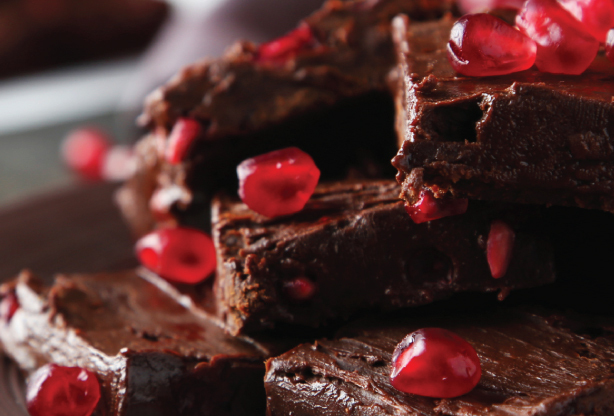 Make the brownie base by mixing together the boxed mix or preparing your own. Spoon half the brownie batter into the prepared pan. Spread the swirl mixture over it and then spoon the rest of the brownie batter on top. If desired, drag a knife through the pan for several strokes from end to end on the pan, which creates a bit of a ripped layer of goat cheese underneath. Bake the brownies for about 35 minutes to 45 minutes. To see if the brownies are done, remove the pan from the oven, and stick the tip of a sharp knife into the center of the brownies. Brownies will be done when the center is set but the consistency is still moist and fudgey.